I would like to win a Spot GPS Tracker because I have four children that walk back and forth to school. As a Christian father, I know the risk that are in the world of sin and one of those risks are child abduction, A GPS device would’t keep someone from taking my child, but it would let me know where my child is if that ever happen. My children are my life. God has bless my wife and I with wonderful Christian children. The world spends millions and billions of dollars on things that children don’t need and yet a simple device such as Spot GPS is probably not included in that list. I pray that Gods Will will be done in all cases, I lost my job on Christmas day, because I chose to spend the day with my children and wife and the company I was working for obviously don’t worship the same God I do. Thank you and God Bless. As editor of BestHike.com I frequently find myself in precarious situations. I try to hike the best treks worldwide as research, often solo. It’s CRAZY for me to be out in the wilderness (currently Baja, California) without a SPOT Satellite Messenger. The life I save might be my own. Well, mom likes to worry, a lot. So much so, in fact, that I’ve concluded the best way to break the news of an adventure is to tell her only AFTER I’m back in (usually) one piece. That or she sees facebook pictures (never friend you mom on facebook). Of course there was that one time I convinced my sister to go skydiving. Mom didn’t think it was funny when I called mid-flight to relay the status of my sister’s first jump, but I digress. Now, if I had a SPOT, I could save her the mid-week worry that coincides with a communication blackout that only backpacking through remote regions can provide – the major downside to my post-adventure-mom-enlightenment technique. No one likes to make mom worry. Of course if I win, I’ll have to explain how I figured telling her “heading north” was the same as “heading to Alaska”…..shoot. Unlike my husband, I have a lot of free time – and come summer, I am hoping to spend most of that free time exploring the Cascades all by myself. A SPOT is at the top of my wishlist, not just in the case of emergency, but also to be able to send my husband an occasional “OK” message on my multi-day trips. I am a Scout leader and am often in the back country with several scouts. This system would be a very nice tool to keep families back home up to date on our location and of course help with any injury situations if they occur. This will better help our scouts “be prepared”. I’m a paranoid mom that reads many news outlets and cringes with fear every time I read a news about a child lost, kidnapped and the worst, found dead. I’d love to have a ‘jump start’ if my daughter were to go missing. I always keep an eye on her when we’re out, but I can’t control everything. It is a good thing and a bad thing that most people have to stop me to tell me how beautiful my daughter is and how sweet she is. She also loves the attention and she’ll befriend just about anyone. She is 4 years old…and won’t stay in my sight for ever. This past year while my family and I were out of state visiting realatives our house was burglarized by our neighbor kid and some of his friends. While some of the criminals are slowly being brought to justice, we are still faced with living next door to one of the culprits. There are still others that may never be brought to justice. All this has made me very concerned about my family’s safety and whereabouts. The SPOT would give me some peace of mind by knowing where my children are while alowing them to get help if necessary. Additionally, the SPOT could give me some peace of mind when out hunting with my 72 year old father. He will probably continue to enjoy the sport until he can no longer get around by himself. From Peru to Patagonia, Tibet to Thailand, the Alps to the Adirondacks, I’ve probably run more backcountry routes than anyone alive. Mostly alone. Mostly with nothing but a fanny pack. A SPOT would help a lot. Living is better than dying. I would use this product as a means of alerting friends and/or family of where I am as I go hiking. Being able to alert others would be a great thing to have if I’m in danger. My climbing partner and I are leaving to go adventuring in the Sierra Nevadas. This would be a very cool tool to have. I had been thinking of buying one before one of our previous trips to Patagonia. That would’ve been very useful then: for emergency situations in case of accidents (there were only 2 of us) for sure, but mainly to ease the worry of friends and family who were keeping track of us by our blog posts on a private page we set up. I remember one time when we were out of range of civilization for 6 days; the Spot would’ve come in handy just to let people know at least once a day that we were alive and well. A blog post couldn’t have done as much! I would like to win a SPOT-2 satellite messenger in order to keep my safe while kayak fishing on local northern California pacific inshore waters… Having this piece of mind and the ability to send messages my wife will keep my WAF account in good standing! What is WAF you ask? Wife Approval Factor. Unless your anthem is Brad Paisley’s “I’m Gonna Miss Her”, you will maximize your opportunities and general pleasure if you keep this account full. The world is crazy. This seems like a good tool to have in case it gets too crazy. I work with Army Cadets in Canada. I often take 10-30 cadets at a time backbacking, camping, hiking, canoeing. Climbing mountains is common. This year, there will be an Army Cadet expedition at Basecamp Everest. I would like to free SPOT GPS Satellite Messenger with one year of service because I feel better knowing that if I lead the kids astray, that someone will find us, and we can let their parents know if we’re okay. As a 60+ year old kayak fisherwoman, I would love to win a SPOT so my husband could track me and help me keep in touch, since most of the time I’m out in the Gulf of Mexico on a solo basis. If a shark ever took me for a “New England Sleigh Ride” and then into the deep, the SPOT would be just the thing to help save my life. Winning this would be “SPOT ” on in keeping this “ole fishing babe” alive and well! As a runner and biker, it would be great to give my family the peace of mind of knowing I can get out a message in the event of a mishap. I would like to win the Spot Satellite Messenger to assist my brother and I on our John Muir Hike scheduled for this July. The Spot Satellite Messenger would give us an extra sence of security knowing that emergency assistance is only a push of the button away. The tracking feature would also help calm both of our wives and our kids, by allowing them to track our progress from home. The Spot looks to be best device on the market! I would love to win this! My wife would love to get an ok message from me when I go backpacking. I would love for her to not worry so much. We hike in wilderness areas in the southern Australian State of Tasmania. No cell service is ever available. The SPOT unit may just be a great way to keep in touch with home and to help out in an emergency. The Spot GPS Trcaker will have a multitude of uses for me, both personally and professionally. Firstly, we have three year old triplets and would love to win three Spot GPS Trackers to evaluate their effectiveness. We are also avid motorcyclists and would love to add a Spot GPS tracker to our “AdventureMan” toolkits when we travel to remote areas. As a poster child for the sandwich generation, the tracker would be a great way to keep tabs on our aging parents. Finally, as VP Operations in a medical device company, I would also like to evaluate the device for medical applications. My wife would be less worried if I had one SPOT with me while travelling. Wanna win one. When my son & I are canoeing down the Macquarie River near our home in Central West NSW, Australia chasing yellowbelly, or when we were checking out the bushranger, Ben Hall’s, cave in the Weddin Mountains NP south of here, or when we were just chasing some solitude at Deep Pass, off the Newnes Plateau in the NSW Blue Mountains east of here. I always got the feeling my wife and daughter are/were never quite comfortable with the idea. My son loves the Australian bush, and getting out in it, almost as much as I do. I want to encourage this as much as possible but I want to minimise the concerns the rest of my family have. We’ve had lots of adventures together and sure, they’re not climbing Everest or K2, but for us, they are just as great and we’ve got stacks more left to do. That’s what the outdoors is all about, JUST GETTING OUT & DOING IT! Most of us will never through walk the Appalachian Trail or the Bibbulman Track but we can do a day walk here and an overnighter there. If parents do not take their kids on these experiences, both the family unit and their appreciation of the environment will be the poorer for it. So removing one of the barriers to this end (ie reducing the anxiety of the family left at home) can only be, in the words of my late grandmother, “A VERY GOOD THING”. We will be healthier, our family life will be healthier and we might all start to take better care of our world. It’s hard to face the reality that often the things we love the most (hiking, climbing, kayaking) make life difficult for those that love us. I don’t want to give up feeling exhilarated at the top of a hard climb, peaceful on a backcountry trail, or humbled on a high peak. But I also don’t want to be selfish. The SPOT GPS Satellite Messenger might be one step towards finding the balance between my happiness and my family’s peace of mind. They bravely support me even though it scares them, and they deserve a little security. It would be great to allow friends and family to follow me on some of my treks in the mountains. Signaling for help is also a plus when things don’t go as planned. The reason I’d like this GPS is fairly simple – I want to experience the full range of outdoor activities with my sons . I want to try out geocaching and think that the exposure to the outdoors will do my two sons an invaluable growth opportunity. I would like to win the GPS tracking device for my 3 year old son to use when he goes with his Dad or for his Dad to use while my son is with me. It would provide a sense of security for the both of us to be able to know where our son is at all times as well as allow away for him to communicate with each of us without having to ask us first. And of course he would have means to emergency help should he ever need it. As a motorcyclist, traveler and founder of Greatest Road Software (http://greatestroad.com/ ), I’m constantly venturing out on new and remote roads that I’ve heard about from people using our iPhone app. Most of them I’ve never traveled before, and many of the ones that interest me are far from civilization. I’ll be visiting roads all over the world, from South and Central America, all the way to Turkey, Australia, New Zealand, China and several countries in Europe. Having a SPOT tracker gives me that extra layer of safety in case something goes wrong. What a fantastic invention! Going to NZ soon, and as I mostly going to do some solo-hiking I’d love to have some more security… My mom at least would be thankful :). The SPOT would come in handy while walking from the Zenith Point (northern most mainland point of North America) on the Boothia Peninsula to Yellowknife. The plan is to carry a bear banger, spray and a SPOT. No Sat phone, no firearms, so the SPOT will be the only way out if it hits the fan. Doing some world travel which will take me off the beaten track for extended periods. SPOT can be a lifesaver! Our family love to camp and fish and the GPS Messenger would be a wonderful to help when we are out on the boat in waters that are unfamiliar to us. We hope we never get lost but you never know what might happen. When we go camping, we like to go hiking and the GPS would be a great tool to have if we were to become lost on the trail. I believe this is a nice drawing to have. Thanks!!! My only child has unsupervised visits with his Dad that is not seeking Professional help. There are no resources available for this safety measure that is so desperately needed. Please help safeguard my child. I have a cousin, Jennifer Marteliz, who has been missing for over 27 years. She was 7 years old when walking home from school and she never made it to her house. To this day we do not know if she is dead or alive. I have a son who is turning 6 this month and I fear every day when he is not by my side that something may happen to him. With a tracking system on him, perhaps this will help alleviate some of my fears. When you have a family member missing it is the most horrible feeling not knowing if they are okay. My family has already gone through such a horrible tragedy, please help us not have to go through it again. I just lost my son at the zoo – the feeling was terrible. I’d love to have one for him! I would love one to tack my kids when they are unable to be with me. I would like to win the GPS tracking device for my 1 year old son. I would like to win because I have been following this technology for a few years now for use with my daughter who is now 8 years old. I have done alot of research and nothing just could cut it technically. There have been abduction attempts in nearby areas and I would just LOVE to see one foiled by one of these devices. There is nothing more precious than children. I can’t believe that the technology for this has not been rolled out sooner. The satelite is the key. Those that use phone towers are only as good as a cell phone signal…. and we ALL know that the signal is never 100%. Nothing is 100% in life. And I am not a pychotic mother. I just see the stories on tv or in the news and wish that there was something that we could do as parents to better protect our children. This device gives us that SOMETHING, plus some. It is a shame that we have had to wait sooooo long for this. Unfortunately my husband has Lewy Body Dementia, the second most common dementia after Alzheimer’s and is beginning to show signs of deteriorating. We are moving into a new home in a few weeks and I am very worried that the change of location and the unfamiliar houses, neighborhood, points of interests, will throw him off even further and that he could get lost if he goes out on his own or with the dog. He already got lost once when we moved into this neighborhood but fortunately the dog had a tag with the home phone number and someone called us. The tracker would ease some of my stress letting me know that I could find him if he wanders. As I sit and read these posts, I realize how fortunate I am with health and family. I want one of these for my son, who “has more chromosomes than your kid” 🙂 – because we love to go hiking and camping. However after reading these posts above, I have to say that the only reason I want to win now is in order to PAY IT FORWARD as a gift to a friend of mine whose child has autism and wanders off without communicating. She could really use it more than me – and I am blessed enough to save up and buy one and she is a single mother who is unemployed. My father has begun his grand adventure, and my children are going to spend the summer with him. We live in Alberta, but our two young children ( 13 and 11 ) will be spending a month with their grand-father sailing from London, Ont. to Moncton, NB. Though I have infinate faith in my dad and his skills as a skipper. I also realize he will be the only adult on board, and alot can happen at sea. It would give my wife and her parents a little peice of mind to know exactly where the children are at any given moment. It would also be comforting for the kids to know that as long as they had the device, we could find them. 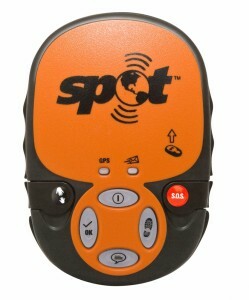 I’d LOVE to win the Spot GPS locator…..my boss just told me about them (he’s an avid rock climber, kayaker, etc. It would be perfect for my husband and I, who are just starting out wilderness camping, kayaking etc! Hi, I would love to win a Spot GPS locator, I havea 87yr old father, who has the onset of Alzheimer’s, my greatest fear is for him to wander & get lost, the thought of him somewhere alone & scared just terrifies me, I have been doing alot of research and although there are items out there, i just don’t have the finances, I work all day & for the 9 1/2 hrs that i’m gone i worry, as it is i call him every hour on the hour & when he doesn’t answer, i am fortunate enough right now to have a family member who lives close enough & is unemployed at the time, who will drive by & do a well check for me, this would be a god-send. thank you for giving people like me an opportunity to win somethings as fantastic as this gift.